An NHS doctor who claimed she was forced into a marriage in Bangladesh cannot be removed from the UK against her will, the High Court has ruled. Dr Humayra Abedin, 33, from east London, was tricked by her parents, held captive for four months and made to marry a man, the court heard. Judges have ruled that she cannot be removed again from the UK without her consent. After the hearing Dr Abedin said: "I'm very happy to be back." Injunctions were issued against Dr Abedin's parents, a paternal uncle and the man she was allegedly forced to marry. Mr Justice Coleridge said: "I shall grant further orders to protect Dr Abedin and prevent her being removed from this country again." Dr Abedin said: "I'm very happy to be back, but I'd like to get back to my normal life and start my job." She said the past few weeks had been "very difficult". "You can understand that being held captive and against the will, it's not very easy." Dr Abedin said that anyone in a similar situation should "not give up hope". Her solicitor Anne-Marie Hutchinson said: "The profile it's (the case) received means that other people will feel that they can come forward and seek the relief that, as Mr Justice Coleridge said, they're entitled to. "He's emphasised what's been said before; that forced marriage is a breach of human rights and where it happens this court will deal with it if cases come before it. "I don't think it is a cultural issue, it's a human rights issue." Dr Abedin came to the UK six years ago to study for a Masters degree in public health at Leeds University. She had hoped to become a registrar at a GP surgery in east London in August but, after receiving news her mother had taken ill, returned to the capital of Bangladesh, Dhaka. A statement issued to the court revealed claims that on arrival at her family's home Dr Abedin was "manhandled into the property by a number of people and immediately locked in a room". Her passport, tickets and other documents were confiscated, she was not free to leave the property and was always monitored by four or five guards, the statement said. Dr Abedin was injected against her will at a clinic or hospital "with what she believed to be mood stabilisers and anti-psychotic drugs", the court heard. On 14 November she "entered into a marriage ceremony against her will and under duress". While in captivity, Dr Abedin raised the alarm by sending an email to a friend in the UK asking for help. 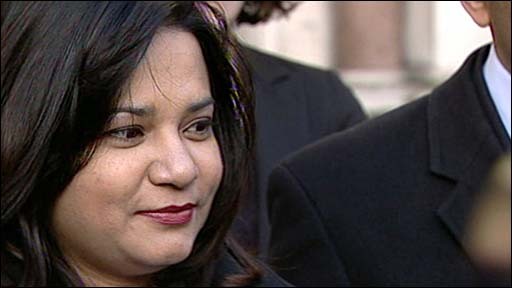 Dr Abedin returned to the UK as a result of a High Court order made under the Forced Marriage Act, issued while she was still in Bangladesh. The new legislation allows British courts to prevent someone from being forced into marriage. On Friday Mr Justice Coleridge said for anyone to go through a marriage without their consent was "a complete aberration of the whole concept of marriage in a civilised society". Dr Abedin's counsel, Hassan Khan, said a petition to have the marriage annulled was likely to be issued "in due course should this be necessary in this jurisdiction".